There it is. I've blogged it, it's official. Acknowledging it is phase one in dealing with my addiction. If you stick around for a few more blog entries during blogtober you'll get to see some of my favourites in my stash, a pic of my disgustingly huge stash about a year ago (I really mean disgusting, it was such an eye opener it really made me feel ill) and preventative measures I'm taking to slow the growth of it any further. I do also knit what I think are some pretty nice garments/accessories too, so the plan is to show a few of those. I blame you TNN! I blame you totally for the threads about the new colours in The Wool Company and Ashford Tekapo *shudders*. Probably not till my Dad was dying in 2007 did I consider knitting like my sisters and mum were while sitting at hospital. I think the first thing I knitted when picking up the needles again was a cardi and hat set for my sister's babe, who actually just turned 4 yesterday. I had bought the yarn off trademe (never again now, but at the time that's where I bought yarn!). I don't think I even knew what Raverly was then! I don't have a photo, but this is my oldest project on Rav as far as I can see...I cringe now looking at my twisting leftie knitting! Again, using yarn bought from trademe. I was told it was DK but it definitely wasn't so I double stranded it. I still don't know how to do lazy daisies. And so, my stash began. With yarn from trademe. But I yearned to join in some co-ops for this 'beautiful' yarn TNN'ers were knitting with. Yarn I'd never even known existed. 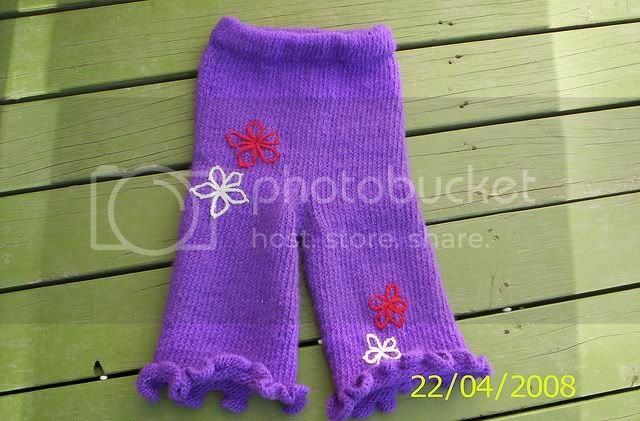 I'm happy to say, I definitely no longer have any trademe yarn left from my early days of knitting. But I have accumulated an awful lot of yarn in the past 4 years! Have you got pics of some of your earliest crafting? Or some pretty substantial stashes of fabric, scrap booking, art, yarn etc materials? Go on, share with me! I do have a photo on Rav of my first project ever finished though - a doll when I was about 11?